Last year's Lisbon champion team was not very deep, but their 5 starters had excellent chemistry together. They played good, smart, TEAM basketball. They got hot at the right time of year, with senior guard Jake Clement leading the way. But now Poore has retired from coaching, Clement graduated and so did fellow starters Dylan Chase and Jamsie Myers. The Panthers will still be a good team this season, with returning starters Chad Knighton (sophomore point guard) and Mike Heath (junior forward). But they definitely have their work cut out for them if they hope to repeat as champs. The 2 preseason favorites in Division IV also just happen to be the 2 teams who met in the title game back in 2009 (Moultonborough won). Both teams made it to the semi-finals last season as well. Both teams also graduated a star player, with Moultonborough losing 6'5" forward Patrick Cotter and Newmarket graduating Player of the Year Adrian Edgerly. Still, even with those guys graduating both of these teams have plenty of talent coming back. They're the favorites to win the title, but even if they don't you can bet that this season will be a memorable one for the Swedberg family. Matt Swedberg is the head coach, his son is 6'7" senior forward Marcus Swedberg - the team's best player and more tan likely the best player in the division as well. 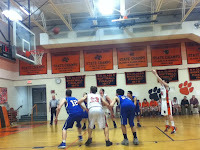 Matt's other son is the team's second best player - 5'11" junior point guard Drew Swedberg. Marcus Swedberg would be a match up nightmare if he was playing in Division I, let alone D-IV. For a kid who's 6'7" he can face up from 18 feet away and hit shots from the outside and also put the ball on the floor and take the ball to the hole. He worked hard in the off-season, especially during workouts and showcases with BST Basketball. He has improved his inside game, decision making and raised the overall intensity that he plays the game with. His little brother Drew is a tough-as-nails, scrappy point guard who controls the tempo, plays tough defense and can hit the outside shot with regularity. The Swedberg brothers are quite the dynamic duo, but the Panthers also have more talent. 6'4" senior forward Nick Sindorf gives the team 3 returning starters. He's a good rebounder and inside scorer. And last year's 6th man Travis Keich-Baier was a valuable piece of the Panther puzzle last season but figures to play an even bigger role this season. He's a tough defender, can play inside or outside and he gives the team 4 players who are more than capable of scoring in double figures on any given night. Ok, so Moultonborough is going to be very good. How about Newmarket? These guys relied on the play making of Edgerly so much last year, how could they possibly be the #2 team without him back? Well folks, it's all about guard play in high school basketball. And believe it or not, but even without Edgerly the Mules still have the best back court tandem in D-IV. They also have a couple of big guys who can rebound and score, and 3 solid role players who play tough defense and can score if you worry too much about the other guys. Newmarket played a 10 man rotation last year, and only 3 of those 10 guys graduated. That means they have 7 kids coming back who all got LOTS of playing time for a team that went 19-2. Moultonborough has the Swedberg brothers, well Newmarket has the 2 Christians. 5'11" junior Christian Hawkins and 5'11" senior Christian Filion form a talented back court. Both of them are capable of dropping between 15-20 points on any given night. Last season opposing teams geared the whole defense towards stopping Edgerly. Now what are defenses supposed to do when game planning for these guys? If you focus too much on Hawkins then Filion will light you up. If you throw double teams at Filion then Hawkins will go off. Hawkins is one of the top defenders in the division, him and Gus Davis are the 2 most athletic players in the division and Hawkins also has an improved outside shot to go with his ability to take it to the rim. Filion is more of a spot-up shooter, if he gets hot from the outside watch out. He's more of a calm, laid back player who lets the game come to him whereas Hawkins looks to initiate the offense and make things happen. Filion is also deceptively quick off the dribble. If you focus too much on stopping the 2 Christians then you're going to get killed inside by Newmarket's 2 big guys, Josh Eisfeller and Peter Carlson who are both 6'4" junior forwards. Eisfeller is more of of a power inside player while Carlson is very thin but runs the floor very well for a kid his size. Both players ar every capable rebounders and inside scorers. The other 3 returning players who also played key roles on the team last year for the Mules are senior forward Robert McGloughlin and junior guards Kevin Clougherty and Zach Jarosz. McGloughlin and Clougherty bring toughness, defense and rebounding while Jarosz is a quick player who can shoot and brings depth in the back court. Moultonbrough is the favorite, and Newmarket looks like the second best team. But this next group of teams is not far behind. Here's a little break down for you. Littleton: Returns 13 players from last year, including D-IV Player of the Year candidate Sam Brammer (a 6'0" senior guard/forward). Went 9-9 last year. Profile: Returns 3 starters, 9 of their 12 varsity players, including all-state player Allen Komisarek (a 6'2" senior forward). Went 10-8 last year. Sunapee: Returns 10m of their 12 varsity players, including all-state player Brian Brewster (a 6'1" senior guard). Went 10-8 last year. Groveton: Returns 9 of their 12 varsity players from last year, including all-state player Nathan Smith (a 6'1" senior forward). Went 8-10 last year. All of these teams were around .500 last year and if they got a couple breaks to go their way they could have made it to Plymouth State for the Final Four. Now all 4 teams return not only their best player but the vast majority of their varsity roster. As good as Moultonbrough and Newmarket are, look for these next 4 teams to give them a run for their money. "Most of this group has been together since 2nd grade" said Profile head coach Paul Greenlaw about his team. "We should be top 8 and if things go well top 4 or 5. Moultonboro is the favorite with Marcus and overall size, but I see D-IV as very competitive again this year with 7 or 8 teams that could make a run at the end of the season." Pittsfield went 11-7 last year and they graduate 2 of their top 3 players. 6'9" center Ben Hill and point guard Kevin Chagnon are both gone, those are 2 BIG losses for a team that was not very deep last season. This will still be a winning team though, because even with those losses they still have one of the division's top 5 players in 6'3" senior forward Donoven Emerson. Emerson is a talented inside player who is very active on the boards and has good low post moves and finishing ability inside. 2 other returning starters are senior sharpshooter Perras and senior guard/forward Dominic Brooks. Also look for junior guard junior guard Elias Doucette to take on a bigger role on the team this year, giving the Panthers a nice nucleus. Derryfield and Colebrook were both very good last year. Derryfield went 20-2, losing in the title game to Lisbon while Colebrook went 16-4, losing in the quarterfinals 58-57 to eventual champion Lisbon. However they both will likely be in more of a rebuilding mode this year. Derryfield graduated 7 of their top 8 players, including all 5 starters so a return to the title game does seem unlikely. They do return 2 pretty good players though with guards Gus Davis and Tyler Zorn. Davis is a fun player to watch because he plays the game with reckless abandon and just goes full throttle every minute he's out there. He's very quick and explosive off the dribble and makes some real shifty, athletic moves in the lane. Zorn meanwhile is only a sophomore but he's one of the division's best pure shooters. Colebrook meanwhile will look to rebuild after the graduation of their star player Tyler Griffin who was a huge reason for them winning 16 games last year. Senior guard Bryan Griffin and junior forward Dylan each are the team's returning 2 starters, with Jordan Bedard and Jordan Siewierski being key returning players who will also have to take on a bigger role this winter. "We're very young and inexperienced" said Colebrook head coach Buddy Trask, who enters his 32nd season at the helm. We have just 1 senior and 6 freshmen, we have a long ways to go." Dark horse teams are Epping, Portsmouth Christian Academy and Concord Christian Academy. Epping graduated their best player in sharpshooter Dan Shennett and forward Brendan O'Day. But they return the rest of the roster from a team that won 8 games, including Frank Stanley, Jimmy Stanley, Paul Holmes, Jacob West and Brandon Carleton who were all solid players last season. PCA and Concord Christian both won 7 games last year and have 8 returning varsity players.